In January of 2014, my husband Kevin and I purchased the established business of Meant To Be in downtown DeWitt. At that time we added fresh flowers to the store, which was the reason for the name change to Meant To Be With Flowers. I completed Floral Design Schooling in West Palm Beach from South Florida Center for Floral studies in 2013. It had always been a passion for me to become a floral designer and I truly enjoy decorating and searching for new, unique ideas! I grew up in a small town in Northeastern Iowa on a dairy farm, and I have always had a passion to work hard, play hard, be kind and pray! I feel very fortunate to own a small business in DeWitt and to be a part of this thriving community! I realize that owning a small business takes lots of hard work, commitment, and a dedication to make every customer that comes in the door feel like they are special. Our main focus at Meant To Be With Flowers is for people to feel welcome and regardless if they purchase anything or not, that they feel at home! I enjoy hearing our customers call this their “happy place”, or when they say they would like to “bottle our smell up and take home”! We have a special candle always burning, butter maple syrup is our signature scent. One of our hometown customer service details is every customer that comes in the door is greeted with a delicious chocolate mint. DeWitt is becoming a “destination small town” and I am honored to be part of the retail businesses. I feel we do our best to direct people to other shops in town if they are looking for something that we do not offer. When customers realize that the retail businesses are working together it makes their shopping experience even more rewarding. As a businesses owners I really enjoy the DCDC’s Look Local First Campaign we have lots of customers, local and visitors to the community, talking about the program and the Chamber Bucks drawings. It is exciting to hear customers for miles away talking so highly of DeWitt! My husband Kevin and I are blessed with four wonderful children, Jenna 25, Krista 23, Colin 20, and Kara 16. I enjoy golfing, exercising, spending time with family and the long hours of being a small business owner. I feel my reward for the long hours and commitment to the business is helping people find those unique gift items, decorating for hours for each holiday, which our entire store is now Christmas! And of course I love to visit with customer and listen to their likes in home décor! Have a Happy Holiday Season and stop by to view our decorated LIVE Window during the upcoming Hometown Christmas Window Walk, on December 2nd! 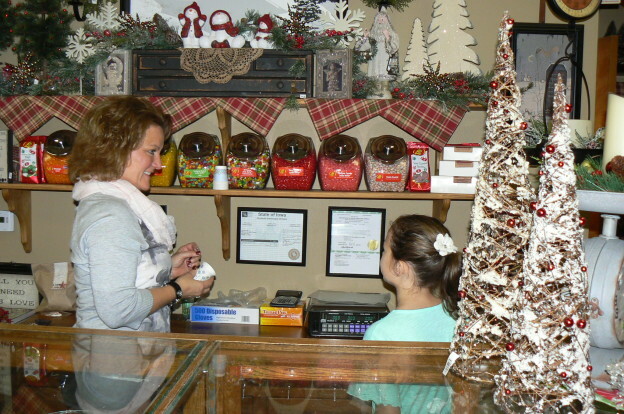 This entry was posted in Community Insights, DeWitt Delivers, Look Local First, Shopping & Dining, Tourism and tagged Christmas, DCDC, DeWitt, DeWitt's Downtown District, DeWitt's Hometown Christmas, Iowa, Look Local First, Meant To Be, shop local, Window Walk on November 21, 2017 by admin. I personally hate shopping, I really do. I know, I’m a woman and I’m supposed to be giddy at the idea. Dropping me at the mall with three hours to kill is like torture. You would most likely find me in a corner at Barnes and Noble with a stack of books waiting for everyone else in my group to be done with their shopping excursions. But, I dare to say there are certain shopping scenarios I can enjoy. You know that day when you weren’t planning on buying anything but you find the absolute most perfect gift for someone? That unique gift that you bought the day you had half hour to kill so you walked through that little store in town. You knew right where I was going with this, didn’t you? But think about it, shopping local is almost always one of the most rewarding and fun kind of shopping there is. Right here in DeWitt, we are so very lucky to have numerous unique stores and shops. I know women from all over who plan day trips to come to DeWitt. They have some lunch at Whisk Away Cafe & Bakery, and then walk 6th Avenue all afternoon. I often hear from out of town family and friends just how friendly people are here; and I know that firsthand. 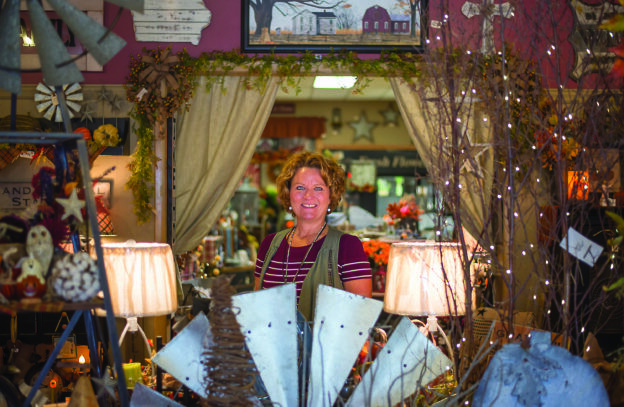 My mom, who often comes from Dubuque to buy her home décor here, is always greeted with a smile and helpful advice when she walks into Meant To Be, her favorite store. My daughter is always treated as a “mini shopper” there as well and loves being the little jellybean sampler! Keeping these unique businesses running and thriving adds to the charming character of our community. And I’m not just talking the antique and craft stores; I’m talking all of our businesses. We’re lucky to have Barnes Foodland in DeWitt. They are continually upgrading and adding more selection. For someone like me with Celiac Disease I especially appreciate that I can now buy some gluten free foods right here in DeWitt and do not have to drive to outside areas. So let’s do some Christmas shopping this month or next! If we all bought just one or two Christmas gifts in DeWitt, think of the money that would be staying right here in our community instead of going to a big chain store. Get your child’s birthday cake from Whisk Away Cafe & Bakery, grab those groceries at Barnes Foodland, expand your wardrobe at The Family Tree, enjoy a coffee at Blondie’s Coffee Out Back drive-thru instead of Starbucks, or take the family to a weekend matinee at the DeWitt Operahouse. And guys here’s the easy part – drive those few minutes it takes to get downtown and buy your lady something nice from Necker’s Jewelers, or that antique table at Emma Rae’s Antiques & Uniques that she said would look striking in the dining room. Yes, I have learned that shopping does not have to be torture; it can actually be very enjoyable. It’s a proven scientific fact (in my mind anyway) that local businesses hire the best people. The business owners and their staff are our friends and neighbors and their customer service makes shopping locally so very worth it! This entry was posted in Community Insights, DeWitt Delivers, Shopping & Dining and tagged Barnes Foodland, Blondie's Coffee Out Back, DeWitt Chamber & Development Company, DeWitt Iowa, DeWitt Operahouse, downtown DeWitt, Emma Rae's Antiques & Uniques, Meant To Be, Necker's Jewlers, shop local, shopping in DeWitt, The Family Tree, Whisk Away Cafe & Bakery on November 23, 2015 by admin.